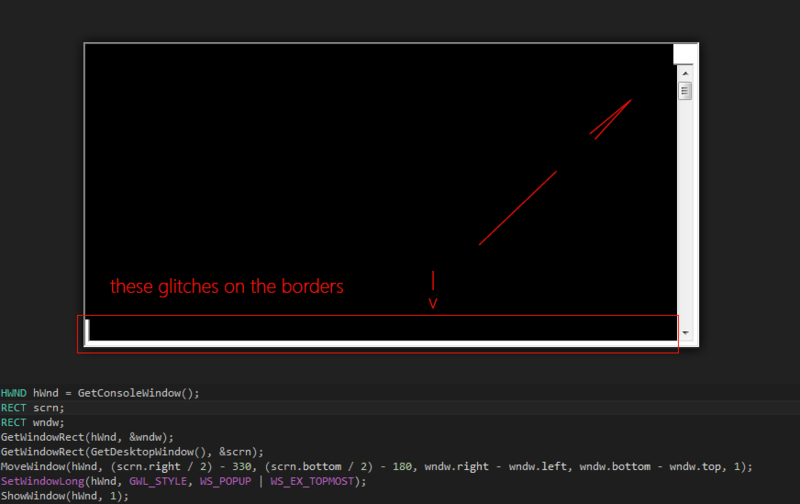 I'm trying to create a borderless console window. It seems that there are some parts on the console window that didn't get redrawn, or something like that, but I've tried using InvalidateRect() on the whole window, and other redrawing functions, but they don't seem to work. Someone suggested using SetWindowPos() (with SWP_FRAMECHANGED), but that doesn't do anything either. Also the bottom glitchy part will turn black/transparent when I first scroll down and then up, but the text in my program sometimes isn't shown under it, which to my knowledge would suggest that it has no background, so it has sort of a 'chameleon' effect. I had to use SetWindowRgn(), just like he suggested.